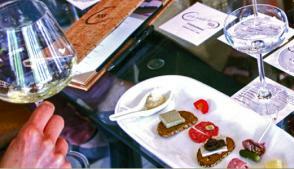 Sip and nibble at Pangloss Cellars Tasting Lounge overlooking the historic plaza in downtown Sonoma. The “elevated tasting” is just what it sounds like: a tour of the hilltop property, followed by a seated tasting in the hillside tasting room, of single vineyards wines complemented by locally sourced gourmet bites. The space is a fitting tribute to local icon Steve MacRostie, who founded his 20-acre winery and vineyards in the Russian River Valley in 1987, and much more recently celebrated the opening of his very own tasting room. In keeping with the décor of rich grained woods, leathers, and glass showcasing the signature MacRostie’s Scottish thistle motif, the views are expansive, and the wines are rich, like the 2011 Twin Hill Ranch Pinot Noir. Reservations required with at least 72 hours notice for the elevated tasting. The recently remodeled tasting room brings rural delights like "Beast & Pinot," a seated adventure that guides you through four limited-production, single-vineyard Pinot Noir wines, partnered with local artisan charcuterie made from duck, rabbit, pig, and cow. There’s also a sushi pairing, and a classic cheese pairing. For the first time ever, the 550-acre property best known for its olive tree orchards is open to the public, with a new tasting room (ok, it’s by appointment only, but still). The draw is sit-down sampling through wine flights such as The Evening Standard Pinot Noir paired with small bites and, of course, sips of elegant Tuscan-style olive oil. You can tour the organic grape vineyards, and add in optional garden and grove tours leading to the magical Chinese pagoda, too. The Gould Evans architecture is breathtaking, in a symphony of sloped ceilings framed by soaring glass wings, a rammed-earth wall, and rich finishes of black walnut, travertine and basalt stone. Taste to try: the $125 Reserve Experience, offering a tasting in the Library enhanced with barrel samples, a cheese-charcuterie board, small bites, and a tour of the 6,875-square-foot estate house, the 7,500-square-foot winery, 12,000 square feet of caves, and vineyards. Hamel Family Wines: 15401 Sonoma Highway, Sonoma Valley, 707-996-5800. It feels oh-so-civilized sitting on a tufted vintage couch in a historic, 115-year-old building overlooking the Sonoma Square, nibbling on caviar, Cowgirl creamery crème fraiche and Rustic Bakery crackers. This tasting lounge is elegance all the way, down to its literary namesake, Dr. Pangloss, the eternal optimist in Voltaire’s novel Candide (that’s him in a portrait on the wall). Tastings include flights of three wines with a wood board draped in delicacies – may we suggest the Burgundy flight of reds with Point Reyes Toma, Cowgirl Creamery Red Hawk, Bleating Heart Fat Bottom Girl, honeycomb, Castelvestrano olives, and blackberry lavender conserve from Gabriel Farms of Sebastopol? Pangloss Cellars Tasting Lounge: 35 E. Napa St., Sonoma, 707-933-8565. The wines cover many of the Sonoma County AVAs, like Carneros sparkling Rosé, Alexander Valley Merlot, Dry Creek Valley Zinfandel, Russian River Pinot Noir, Sonoma Valley Cabernet Sauvignon, and a 2012 Sonoma County red blend. Add to that nibbles like hummus, rillettes, salumi, cheeses, fruit, and pickle, and you’ve got this new destination from former Viansa Winery owner Lloyd Davis. Enjoy friendly service, and a pretty, relaxed setting with glass tables and local landscaping paintings for sale. Corner 103 Tasting Room: 103 W. Napa St., Sonoma, 707-931-6141. It’s new… and old. The original winery was built in 1887, but a few years ago, the Stewart family bought the property, and then they built a winery, remodeled the tasting room, and added a new dining option for bites like housemade rosemary potato chips or pumpkin ravioli with fontina cream, pecans, cranberries and crispy sage. Sonoma County wines come from all appellations, so it’s a Wine Country tour on the tongue. Valley of the Moon Winery at Madrone Estate Tasting Room: 777 Madrone Road, Glen Ellen, 707-939-4500. Perhaps it shouldn’t be surprising that St. Francis Winery & Vineyards in Santa Rosa has been named twice as the No. 1 restaurant in all of America, courtesy of Open Table. Learn more about their award-winning, seated, multi-course food and wine pairings. 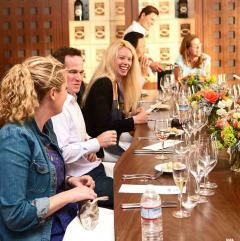 St. Francis Winery & Vineyards: 100 Pythian Road, Santa Rosa, 888-675-9463.